It’s Halloween and you find yourself looking for something to play that is thematically fitting. 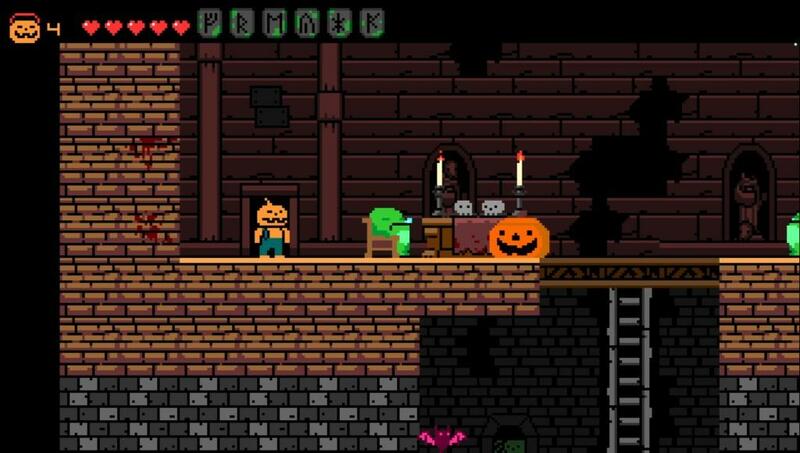 You throw on Halloween Forever and start guiding Pumpkin man through the 8-bit adventure unfolding in front of him. You are only a short way into the 2D experience before you are overwhelmed with 80s gaming nostalgia but its 2018, you’re holding a Dual shock 4, and you realize that retro is now more of a genre than an era. Making sure to fall in line with many of the games from the time, there is very little story to this title. An evil Necromancer has found his way to the graveyard and begun raising all sorts of evil minions to presumably turn everyday into Halloween. Due to his haste, carelessness or maybe sheer stupidity, we don’t really know because it’s never explained, he also raises the Pumpkin man who immediately knows that it is his task to put a stop to his creator, just because. Right from the outset, everything handles just fine and you will feel in control from that moment on. Double jumping provides both the distance and precision that you will be relying until the end credits roll and you will always be able to depend on your attack of choice, which for Pumpkin man is the candy corn that he vomits. The attacks however do not fire straight forward and will take a bit of getting used to in order to be able to properly time and gauge their trajectory in order to hit your enemies, especially when they are on the other side of a pit. 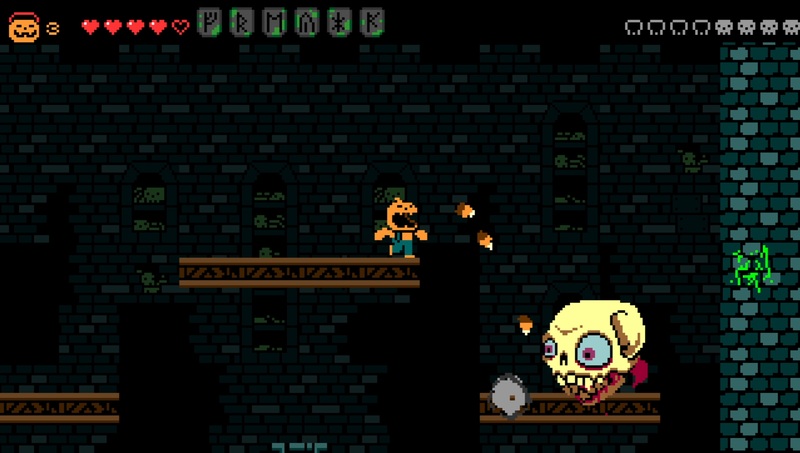 Speak of pits; there are many instances of spike pits in the game which will result in instant deaths. Normally this is not the worst but it is combined with another of my least favorite retro gaming elements, the dreaded knock back. The game is not overly challenging from a mechanics standpoint but you do only begin with 2 lives and they can be easily depleted in instances where you are trying to make a jump only for the mage on the other end to barely brush against you, resulting in your limp body being thrown backwards into the pit you just cleared. 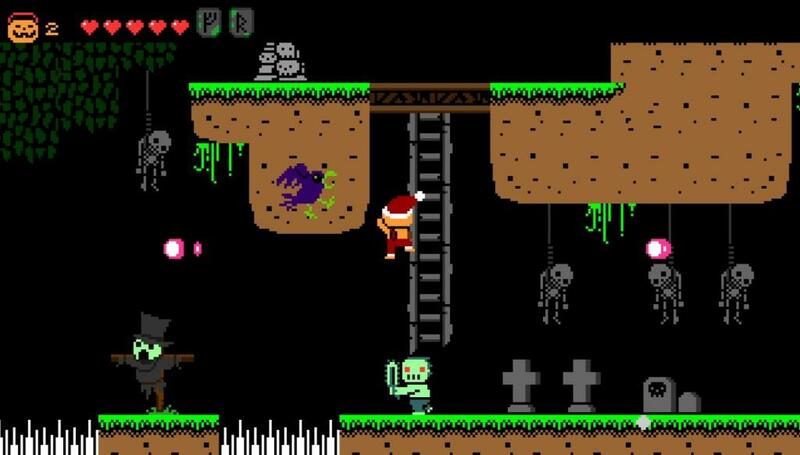 As a result of that otherwise low difficulty, you will find yourself completing the 5 levels fairly quickly. Each level is even broken into two stages with a boss fight denoting the end of them. While the boss fights are fairly imaginative and entertaining, they will only take a few attempts before pattern recognition registers and you breeze through them as well. Once you have had some time to acquaint yourself with the games tendencies you will be able to complete it in about 30 minutes. Normally this would be a complaint but it does come with a very low cost of entry so it’s forgivable. There is an attempt made to extend the replay value by putting in multiple unlockable characters, branching paths and some secret areas that you will need to explore in order to find the 6 hidden runes that unlock the secret ending. The extra characters didn’t really motivate me as they are primarily different in appearance and slight changes to how their weapons act. For example, the witch throws cats where if they hit the ground begin running allowing for them to still hit an enemy. To me the graphics are great although much like their design intended are very basic and simplified. It’s almost like the goal was to make things distinguishable as what they are intended to be and then go no further. Can you tell that the group of purple pixels with a beak coming at you is a crow? Great, mission accomplished. Nothing will make you stop in awe but you will never have to wonder if the object before you is a fence that is part of the background or the chainsaw wielding maniac that wants to carve you up to for his front porch. It’s an odd phenomenon to consider graphics that don’t go far beyond the functional status as a success but here we are. Overall, I enjoyed my time playing Halloween Forever but that comes with the idea that I was prepared for a game whose main attractions are conventions left behind decades ago. If you are interested in a fairly short trip down memory lane then you could absolutely justify a purchase, especially with the low cost of the game.